I must admit, I've been rambling too much about my two failed attempts. At this point, I'll put them into good use... I have compiled this extensive guide for Whale Shark Interaction in Donsol Sorsogon, probably the most extensive you can find on the net. The name "whale shark" or locally called "butanding" comes from the fish physiology that is, a shark as huge as a whale that shares the same filter feeder eating mode. As filter feeder, these gentle giants feed on planktons, algae, and small nektonic life. Donsol Bay has the largest concentration of whale shark in the world. Town of Donsol, Province of Sorsogon, Region of Bicol, Southern Luzon, Philippines. These gentle giants are believed to migrate to the plankton rich warm waters of Donsol Bay between October to June. It's best to go on a sunny day, between March to May. Increase your chances when timed not on a full moon and when you go out at sea early in the morning. Early morning is feeding time and the sea is calmer. As I spoke to a Butanding Interaction Officer, he stressed that it is not appropriate to say whale shark watching in Donsol but rather whale shark interaction in Donsol. It is their aim for tourists to actually interact with them. All whale shark interaction tours are managed by the Donsol Tourism Office (Tourist Center), they are open from 7am to 5pm. One shall register and pay the fees at the tourist center, located by the seaside right next to Vitton Resort. Your assigned BIO will lead you to a two minute walk to the shore to board your outrigger boat. Outrigger boats are allowed to sail between 730am to 3pm. During peak season, trips are scheduled to leave at 730am and 1030am with a maximum of 20 boats at a time. > children 7 years and below ride for free in excess of the 7pax count. + P100 registration for locals (P300 for foreigners) valid for 5 days. When you contact your resort of choice, bank to bank payment transfers is generally required to confirm your reservation. ALL rooms are with ensuite bathroom and private veranda overlooking the beach. If you're on a tight budget, you may pitch a tent, shower rooms are available for rent at the resort or opt to stay in Donsol town proper, about 3kms away, 10 minutes trike ride (P10/pax). The likes of Hernandez Guest House and Erna Guest house offers a bedspace for P200/head with common bath. Feast on seafood and try out local delicacies like bicol express (pork strips with chilli cooked in coconut milk). You may eat at Vitton Resort (order in advance, it takes a while for them to prepare), Amar Farm Resort (good and reasonably priced), Gennevie Resto and Barracuda Resto or opt to go to Donsol Town's Market and get some fresh catch to be cooked at your resort. MANILA - LEGASPI CITY - DONSOL is the best route. Option 1. BY PLANE: daily flights from Manila to Legaspi City via flagship airline PAL or budget airline Cebu Pacific (45 mins). or 5 times weekly from Cebu City to Legaspi City via twin-turbopropeller of Cebu Pacific (asked to be seated at the front row or rear most part of the plane, the propeller can be noisy in the middle). If you're coming from other cities like Davao, Cagayan de Oro, Palawan, there are no direct flights, one must go through Manila or Cebu for a connecting flight to Legaspi City Airport. Then see Option A-C below. Option 2. If flights are full, fly from Manila to Naga City. 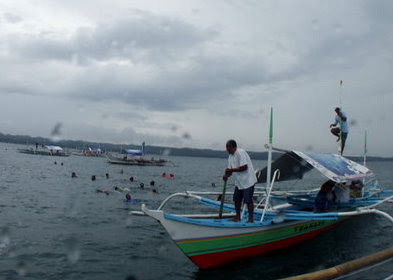 [You may opt to spend a day wakeboarding at Pili, Camarines Sur.] From Naga, take a trike to the Van/Bus Terminal, ride a van that will take you to Legaspi City for P140 for a 2 to 3-hour ride. Vans headed for Legaspi are in the van Terminal just across of the bus terminal. There are also buses for Legaspi from Naga but they take longer since they stop frequently. Private vans are also available for hire for about P4,000. Option 3. BY BUS(10-12hours), daily trips from Cubao, Quezon City, Manila to Legaspi City on Philtranco for about P600-900 per way, other bus lines are also available. Transit from Legaspi through Option A or B below. Option 4. By boat from Cebu to Masbate (P480-P1800, 10 hours) via Trans Asia Shipping Lines (Sulpicio Lines is cancelled as of this writing), take a ferry from Masbate to Pilar Town (P360, 2 hours), take a jeep from Pilar to Donsol Town Proper (30 minutes), take a trike to (Tourist Center) Dancalan, Beach Area (P20-30). Option C. Approach the tourist desk at Legaspi airport's arrival terminal, they will arrange a private van to pool other tourists, the cost of P1,500 per van shall be split among them. For more information, visit Albay Tourism or Sorsogon Tourism. More tips from real travelers . * Plane tickets comprise the biggest chunk of your expense, fares can go as low as P1,500 or a high of P8,000 per way, so it's best to book early. * It's ideal to keep your itinerary flexible, flight and bus schedule maybe delayed. You don't want to have the same story as mine. * On the plane ride to Legaspi, request to be seated on the left side of the plane (facing the cockpit) to get a view of the Mayon Volcano when landing. 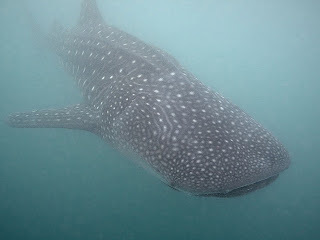 * Whale shark sighting is not guaranteed but with high possibility (5-7 sightings on the average). It's best to have at least two mornings in your itinerary to do the tour. * Check the local weather here. It must be sunny. Bad weather or continuous heavy rain will affect water visibility and an overcast might be difficult for the spotter. The weather in the region is quite unpredictable. * Avoid peak season, spotting one will be like a race. More than 20 boats will be chasing after one spotted shadow especially when water visibility is limited. * Start early, the tourist center opens at 730am; limited number of boats is allowed to sail, next batch starts around 1030am and it can be rowdy when there are too many tourists. * You will be asked to watch a 15-minute interaction guide video, you can do this a day ahead to get started early. * The tourist center does not accept advance booking (or so they say). They will assign a BIO and his team on rotation. NOTE: Advance booking is not required. * If you're a solo traveller or small group, you can request the tourist center to match you with other travellers to share the cost of the boat. * Children are allowed to join, you may request for additional BIO to assist them for a fee. * Psyche up yourself to see a huge fish about 5 to 15 meters, as big as a bus! Don't panic these gentle giants are filter feeders. For your safety, observe the interaction guide at all times. * Gear up once on board, your BIO shouts 1-2-3 jump! anytime. Interaction site is just 10 minutes away from the shore. You don't only watch or swim but interact with the whale sharks; strong swimmers will have an advantage but the adrenalin rush will help you through. An interaction can last from a few seconds upto an hour if you're lucky (5-10 minutes on the average). * You may have to wait on the boat a few minutes or an hour in between sightings. Have a hearty breakfast and pack enough food and drinks to fill you up. * Bring spare cash, souvenirs like hand painted shirts are available for sale. * Give your BIO and crew a well deserved tip, interaction with the whale shark is priceless. Connect the Dots, volunteer, or donate in WWF conservation programs contact them. *view of Mayon Volcano along the road, or trekking tours up the volcano. *visit Cagsawa Church Ruins, 15 mins away from the airport and be welcome by children who will offer their services to be your guide and take some fun poses of you. @tutubi, me too. i ought to go back next year. I'll post a link to your backpacking donsol guide here, i found that very informative. Hands down to your 8-day Donsol experience. How I wish I also have the luxury of time to do the same. Whoa!.. Really? Donsol, the one near Sorsogon City? has one of the largest concentration of whale shark? john & carla, my pleasure. melody, yes you're right. Donsol, Sorsogon, Bicol Region - Philippines. You may ask your resort to arrange for you (Vitton offers). I am joel Briones, One of the senior guides here in Donsol, and i am not a picky one for their tips hehehehee but their tip is ok. I want to invite tourist to come here and contact me for their convenience and facilitate their tour. We are inviting everyone to experience the thrill and excitement with the Whaleshark, the Gentle Giants of Donsol. Dubbed as, "The Best Animal Encounter in Asia". We are very sure that your trip will be exciting as you come along way with this Gentle Giant. see you guys here and TC..
an awesome post, parang andito na talaga lahat. one question though, ano yung month ng peak season? japanesecake, i've written the peak season read through again. :) but the bestest time should be end of march and early april. made the updates rasyl. wow, rates are increasing annually. hope the facilities are improving too. On my last visit, Vitton had expansion plans of putting up a spa. Anything new with Amor? Yeah, we have increase a litte with the rates, especially with the new rooms to cater the guests requirement,e.i..AC and fan room both with hot & cold shower, and we made renovations of our old rooms (nipa huts) which we have since the first time people recognised Donsol as the whaleshark hub, as it has aged:)...We have now 20 rooms in total and have had expanded the restaurant as more walk-in guests seem to like our food ;) , and we have Bar, near the beachside,operating recently..We have in a row additional amenities for next season..i'll keep you posted on thiss..cheers! hi freeze, r u from cebu also? thanks for the info. Anyhoo, can you also give info but firefly river cruise? it would really be helpful to get some contact numbers, prices and other tips? anonymous, yes, i'm a true blue cebuano. the outrigger boat rental for the firefly river cruise was P1,250 for maximum group of 5 people. (in 2009) Sorry, I don't have contact info, simply arrange with your host(where you will be staying) when you get there, it's just the same rate. Just don't book through travel agencies. The bangka will even pick you up in front of your resort if the tide is low, if not, they'll take care of the tricycle ride. Advance booking is not necessary; they just paddle on a small bangka through a river. the term cruise is just glorified. :) But those fireflies are such a pretty sight. On your way from Donsol Town to Donsol Bay, you won't miss the bridge where you'll do the river cruise. This is so informative! Awesome post. Thank you so much! Wow, this is really the best post about whale interaction. If I may ask, is it possible to do whale shark interaction and firefly tour in one day? It's our first time in Bicol and we already booked our hotel in Legazpi for the whole 3 days. If it's DIY with firefly tour, where can we get a ride going back to Legazpi? If you would be coming back to legaspi in the evening, i would suggest that you rent a van, im not quite sure about public transport in the evening, donsol and legaspi is more than an hour travel across paved roads, winding up and down a mountain at some point.